Under the theme of “New Era, Shared Future”, the CIIE will help friends from around the world to seize opportunities presented by China’s development in the new era and offer a platform for us to deepen international business cooperation for shared prosperity and progress. Attending the event are 172 countries, regions and international organisations, more than 3,600 companies with a total exhibition area of 300,000 square metres, and more than 400,000 Chinese and foreign buyers who are here to explore business deals. It is important for all countries to open wider and expand the space for mutually beneficial cooperation. Openness brings progress while seclusion leads to backwardness. Global trade and investment are driven by the need of countries for mutual exchange and complementarity. The history of economic cooperation and international trade testifies to the law that “economies make progress through exchange and inter-connectivity and fall behind because of seclusion and closedness”. 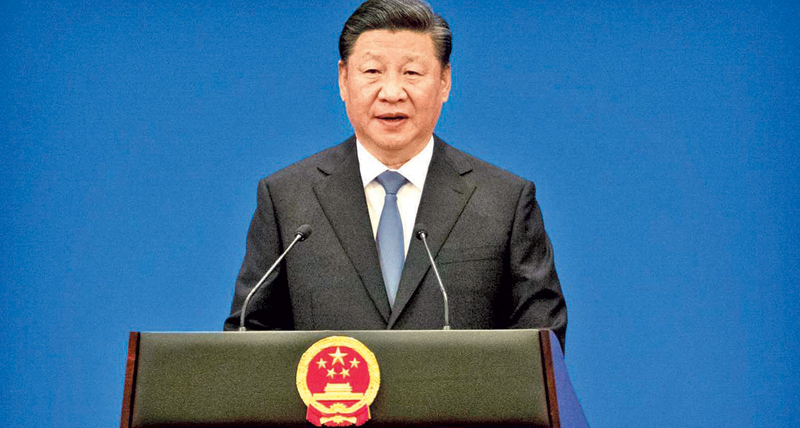 Efforts to reduce tariff barriers and open wider will lead to inter-connectivity in economic cooperation and global trade, while the practices of beggaring thy neighbour, isolation and seclusion will only result in trade stagnation and an unhealthy world economy. Countries need to pursue an open policy, explicitly oppose protectionism and unilateralism, and strive to enhance the level of opening-up at both multilateral and bilateral levels, so that we could make our economies interconnected and build an open world economy. We need to improve macroeconomic coordination and reduce the negative spillovers of national policies to jointly promote global economic growth. We need to establish a set of global economic and trade rules that is fair, reasonable and transparent, and promote trade and investment liberalization and facilitation to make the global economy more open through greater exchanges and integration. It is important for all countries to pursue innovative growth and speed up the transformation of growth drivers. Innovation is the premier engine for development. Only with bold innovation and reform can we break the bottlenecks in global growth. The world economy has just emerged from the shadow of the international financial crisis and recovery is still unstable. There is an urgent need for concerted efforts of countries in the world to promote scientific innovation and foster new growth drivers. The well-being of humanity is the biggest driving force for scientific innovation. In our inter-connected global village, to share the fruit of innovation is the common aspiration and natural choice of the world community. We need to seize the opportunities presented by the new round of technological and industrial revolution, strengthen cooperation in frontier sectors such as digital economy, artificial intelligence and nanotechnology, and work together to foster new technologies, new industries, and new forms and models of business. It is important for all countries to pursue inclusive development for the benefit of all. As a Chinese saying goes, “All flowers in full blossom make a beautiful spring.” To lead a happy life is the common aspiration of people all over the world. Progress of the human society requires continued efforts of all countries to advance opening-up, cooperation and win-win development, instead of seclusion, confrontation and monopoly. In a world of deepening economic globalization, practices of the law of the jungle and winner-takes-all only represent a dead end. Inclusive growth for all is surely the right way forward. Countries need to rise above differences and leverage their respective strengths to pursue inclusive growth in the face of common risks and challenges. We need to implement the 2030 Agenda for Sustainable Development, reduce the imbalances in global development, and make economic globalization more open, inclusive, balanced and beneficial for all. This way, people of all countries will be able to share in the benefits of economic globalization and global growth. So, when you talk about the future of the Chinese economy, you have every reason to be confident. The fundamentals for sound and stable growth of the Chinese economy remain unchanged. The necessary production factors for high-quality development remain unchanged. And the overall momentum of long-term stability and progress remains unchanged. China’s capacity for macro-economic regulation is growing, as efforts to deepen reform across the board have unleashed new drivers of growth. With the Belt and Road Initiative being further implemented, two-way investment and trade between China and the BRI partner countries have continued to gather pace. All in all, the favourable conditions are in place for the long-term, healthy and steady growth of the Chinese economy. China is the world’s second largest economy. We have a market of more than 1.3 billion consumers who live on the land of over 9.6 million square kilometres. To use a metaphor, the Chinese economy is not a pond, but an ocean. The ocean may have its calm days, but big winds and storms are only to be expected. Without them, the ocean wouldn’t be what it is. Big winds and storms may upset a pond, but never an ocean. Having experienced numerous winds and storms, the ocean will still be there! It is the same for China. After going through 5,000 years of trials and tribulations, China is still here! Looking ahead, China will always be here to stay! To capitalize on the important role of Shanghai and other areas in China’s opening-up, we have made the following decisions: First, we will expand the China (Shanghai) Pilot Free Trade Zone to include a new section, and will encourage and support bold and creative steps by Shanghai to advance investment and trade liberalization and facilitation so that more of its successful practices may be replicated in other parts of China. Second, we will launch a science and technology innovation board at the Shanghai Stock Exchange and experiment with a registration system for listed companies. We will also support Shanghai in cementing its position as an international financial centre and a hub of science and innovation, and steadily improve the fundamental institutions of its capital market. Third, we will support integrated development of the Yangtze River Delta region. We will make it a national strategy and implement our new development philosophy in real earnest. We will build a modern economic system, and adopt higher standards for reform and opening-up. The region will develop in tandem with the Belt and Road Initiative, the Beijing-Tianjin-Hebei coordinated development area, the Yangtze River Economic Belt and the Guangdong-Hong Kong-Macao Greater Bay Area, and will help improve the overall layout of China’s reform and opening-up. The CIIE is an event hosted by China with the support of the WTO and other international organisations as well as a large number of participating countries. It is not China’s solo show, but rather a chorus involving countries from around the world. I hope that at the Hongqiao International Economic and Trade Forum, you will brainstorm ideas for reforming the global economic governance system, for jointly safeguarding free trade and the multilateral trading system, and for working together to foster an open global economy that is innovative and inclusive. Together, let us contribute to our common determined efforts to build a community with a shared future and usher in an even better tomorrow for mankind!